A stylized image of a side view of a person's face is shown, with the skeletal framework of the teeth and some of the inner structure of the nose visible in an outline that suggests the shape of the head. A purple fractal background is seen behind the image. What has recently become standard of care for adult ear, nose and throat (ENT) surgery is now being studied in children, via a novel clinical trial led by investigators at Penn State. That’s why Director of Head and Neck Surgery at Penn State Health Milton S. Hershey Medical Center, Dr. Neerav Goyal, has launched an investigation of tiny, flexible robotic surgery tools—a system called the Medrobotics Flex System—in children requiring ENT surgery. “The idea is to see if we can use robotic surgery devices to achieve similar operative access but with better dexterity than we have with open surgery or laparoscopic tools,” says Goyal. The Flex System offers a more wrist-responsive control system than laparoscopic tools and is much smaller than other robotic surgical tools, including the popular DaVinci system. Goyal’s current clinical study takes a conservative approach: no interventions, cuts or treatment with the robotic tools. Instead, after a surgery has been successfully completed in the traditional way, Goyal does a quick check to see if the robotic tools would have been able to access the surgical site without difficulty. 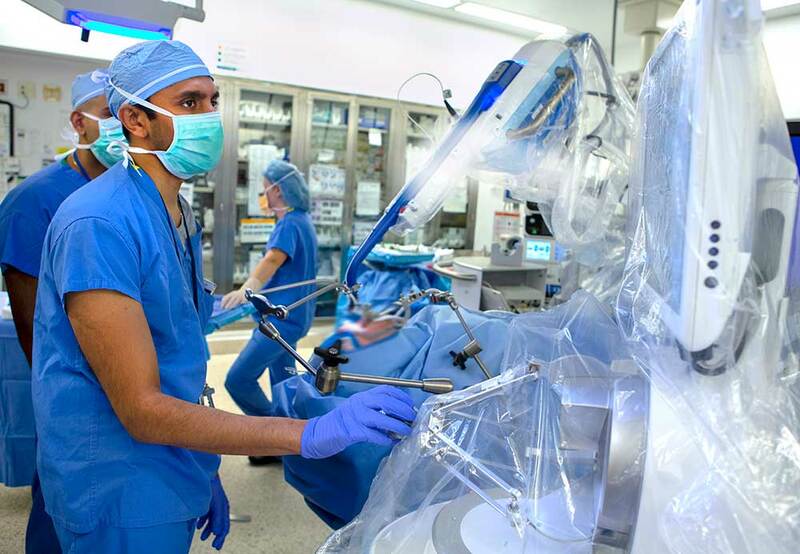 Dr. Neerav Goyal uses the Medrobotics Flex System—small, flexible robotic tools able to operate in tight spaces—to perform head and neck surgery on a patient. The trial, funded by Medrobotics, is starting with children ages 8 to 12 undergoing the safest operations, such as tonsillectomies and adenoid surgery. Provided the robotic device fits well for these children in the most direct-access surgical sites, the research will expand to a younger age group (ages 4 to 7). He intends to recruit 30 patients in total for the initial investigation. If all goes well, Goyal hopes to then launch a trial examining more complicated access points, such as the voice box, as well as a trial actually using the tools to perform the operations. Goyal and his fellow surgeons in Head and Neck Surgery at Milton S. Hershey Medical Center have previously evaluated the technology in adults for general head and neck surgery as well as cancer cases. His group performs more Flex robot-assisted procedures for head and neck cancers than almost any other center in the nation. 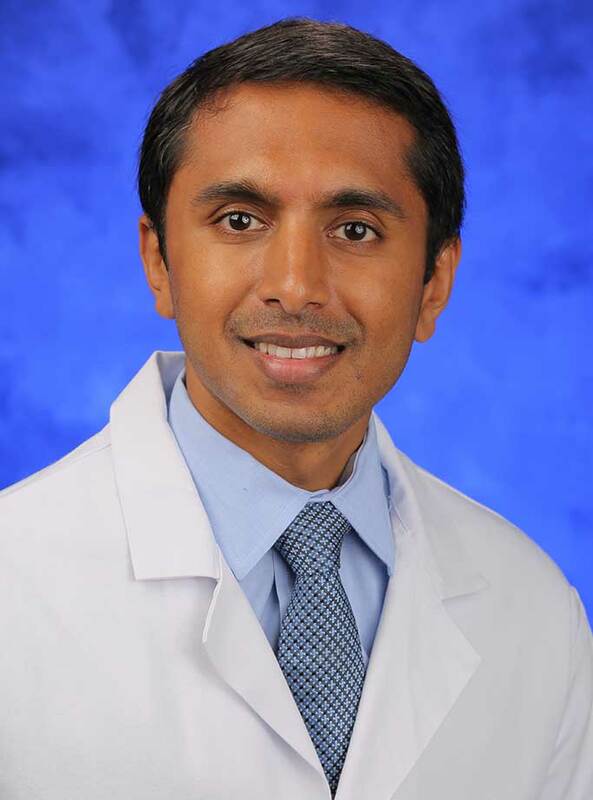 Goyal and his team have also published broadly in both traditional surgical techniques and robotic approaches in adults, including recent evaluations of the potential utility of the Flex System in laryngectomies and an anatomical atlas for robotic head and neck surgery. Funk E, Goldenberg D, Goyal N. Demonstration of transoral robotic supraglottic laryngectomy and total laryngectomy in cadaveric specimens using the Medrobotics Flex System. Head & Neck. 2017 Jun;39(6):1218-1225. Goldenberg D, Goyal N (Eds). Robotic head and neck surgery: An anatomical and surgical atlas. 2017. Thieme: New York. The Division of Otolaryngology – Head and Neck Surgery – at Penn State Health Milton S. Hershey Medical Center offers an advanced team of surgeons and providers to treat disorders of the ear, nose and throat. The division is made up of fellowship-trained experts in pediatric ear, nose and throat disorders, facial plastic surgery, head and neck cancer surgery, skull base surgery and ear surgery, offering the most innovative and advanced treatments for patients’ ear, nose and throat concerns.